For parents and teachers of struggling students, some of the many helpful resources out there may not necessarily be targeted to those with learning challenges. I’d like to introduce you to a few hidden gems from Teachers Pay Teachers. My hope is that these not-so-obvious resources make your efforts to help your child improve learning abilities a little easier. Let’s begin our treasure hunt with Melissa’s Teacher Mall. Hi Everyone. I am Melissa from Melissa’s Teacher Mall. I have been teaching since 2006. I opened my Teachers Pay Teachers store because I wanted to highlight the benefit of centers/stations. I find that my students really blossom in small group instruction and I wanted to share my resources with other teachers. In our center rotation we have 2 games centers. Parents can play these games at home with their children to reinforce any skill the child needs. 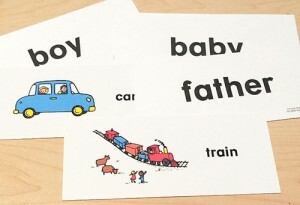 The sight words cards I used with my Kindergartener. Just grab a set of task cards. You can make your own or purchase a set. Task Cards are just fancy flash cards. They can be very basic or very detailed. Look for a set that targets what you are working on with your child. Use cards that challenge your child. And make up a game. The basic instructions are below for the games we use in our classroom. 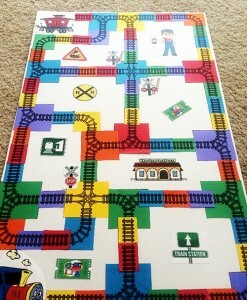 Here’s a game board I made for my train lover. Game Boards – Use a Chutes and Ladder Game Board or any game board, a set of dice and task cards in the subject area your child is struggling. The player must answer the question on the task card correctly before they move. This is a fun way to reinforce any skill. As you play you might want to get a few wrong just to show your child that you are not perfect. Showdown – Stack task cards in the center 1st player reads the top card. All players write the answer on a piece of paper or wipe off board. Turn your paper face down and wait for everyone to write their answer. When everyone is ready the answers are revealed. You can keep score by getting a marker or chip for each correct answer or make tally marks on a piece of paper. Make a memory with your child, play a game. Just remember games should be fun. It is OK to be silly and I usually let the kids win. Melissa’s Teacher Mall specializes in differentiated learning, Common Core, and center/station activities for use during guided reading. Find Melissa’s Teacher Mall here on Teacher’s Pay Teachers. Check out her blog here.